But I often think that the lack of potable water in the badlands is what really made this area earn its name. For most park visitors or area residents today, this poses little challenge. We turn on the tap and out comes safe, clear drinking water. Hikers fill up bottles before venturing out on the trails. Backpackers on overnight trips often limit the length of their stay based on the amount of water they can carry: foot travelers should bring along a minimum of a gallon per person per day, and in the heat of summer planning on two gallons per person per day is prudent. That water weighs a lot, at a little more than eight pounds per gallon. Even an overnight trip in mild conditions adds nearly seventeen pounds to a hiker’s load. Still, we have it easy today. Imagine traveling through this landscape on foot or horseback a hundred years ago, before piped water made having a drink as easy as turning a faucet handle. Suddenly the lack of water is a potentially life-threatening problem. The badlands we see today were carved out by the White River, visible in the valley just a few miles distant, but don’t be fooled: the water in the White River is not fit for consumption. On one day in May 1982, the White River’s total sediment load at a sampling point near Oacoma, SD, was measured at a mind-boggling 1,640,000 tons. Minute clay particles eroded from the badlands formations remain defiantly suspended in the water. They’d clog a backpacking filter before you could get anything drinkable out of it. I went out for a four-mile wander on the Castle and Medicine Root trails yesterday afternoon, taking advantage of a sunny, windless, fifty-degree day. I found water, water everywhere—always a remarkable sight in this semiarid place that gets eighteen inches of precipitation in a good year. (2012 was not a good year, with only about twelve and a half inches.) Snowdrifts in shady hollows, the last vestiges of a winter storm two weeks ago, dripped water that turned badlands clays into boot-sucking mud traps and ran off in opaque streams. 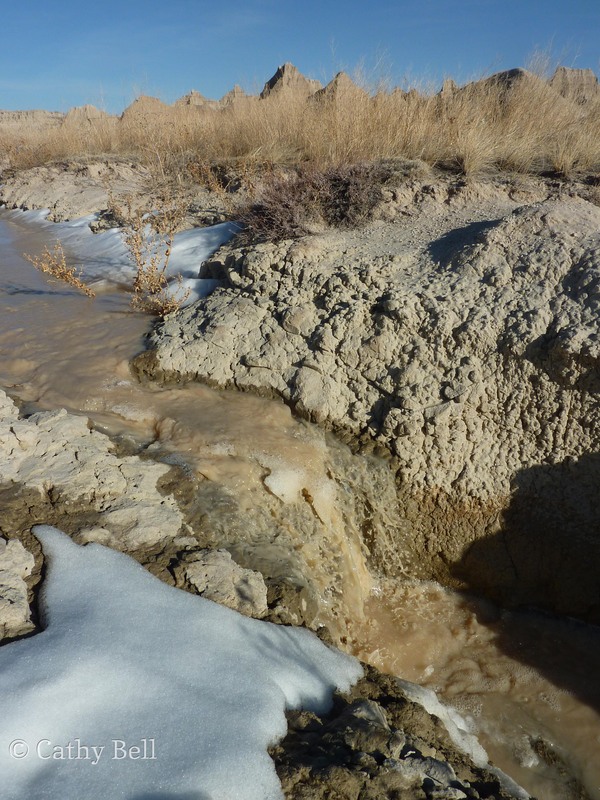 Melting snow-fed muddy streams throughout the badlands this weekend. I spent a long time watching the behavior of the water on the landscape, fascinated anew by how the interaction of water with sediment is so scalable. 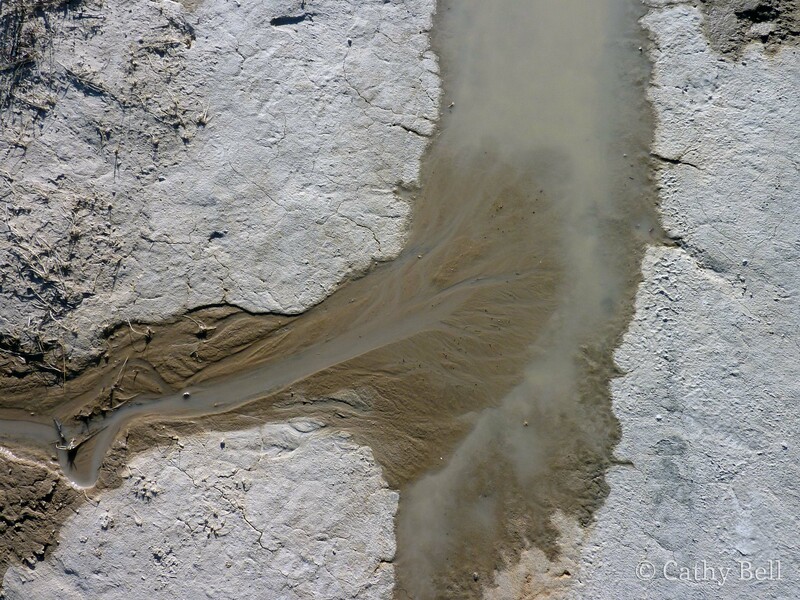 You can see the same processes in a tiny runoff stream in the badlands as you see in a mighty river. Let’s take a look. 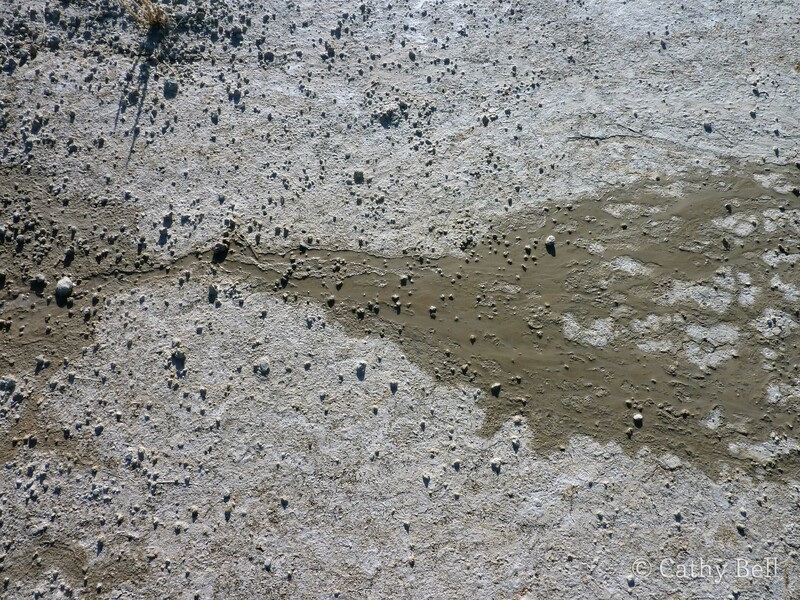 Sediment-heavy water from a small runoff stream joins a larger, slower-moving channel, forming a miniature river delta. Whether it’s in the smallest rivulet or the most roaring creek, fast-moving water packs a strong punch. 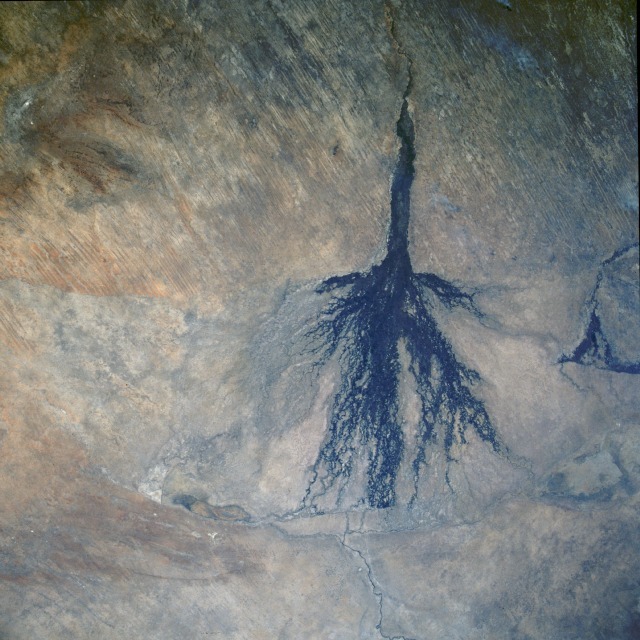 It abrades the surfaces it passes over and alongside, and picks up particles of sediment. Depending on how steeply the stream is falling and how fast it’s running, it may roll cobbles or even boulders. Lazy, meandering rivers with a gentle gradient can usually only carry finer sediment. 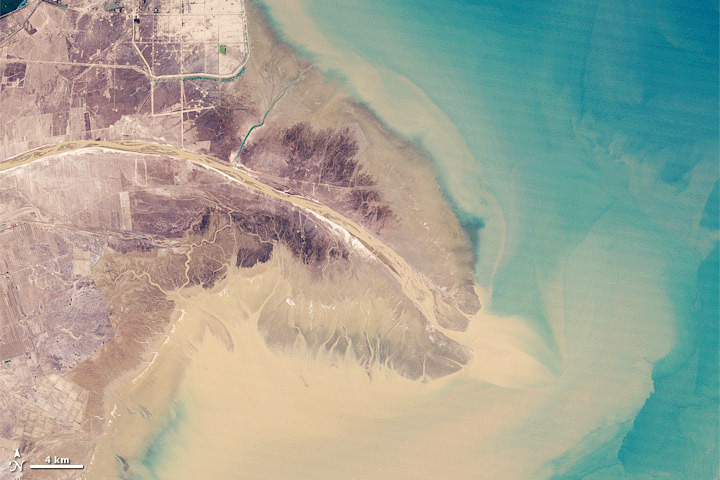 A similar delta, just a foot or so across, in a badlands runoff channel. When a stream slows down, it can no longer carry the larger particles of sediment in its current load. These settle out and are deposited. This happens when a big river flows into a lake or ocean. It may also happens when a little rill flows into a larger, more placid channel (as in the two images above), or when a rivulet that has been making its way over a dry surface hits a break in slope and flattens out (below). A miniature inland delta or alluvial fan, where runoff on a relatively steep slope arrives on a flatter surface. As the water slows, it fans out and deposits sediment. The Yellow River (Huang He) Delta in 1989. NASA Landsat image. … and the vast inland Okavango Delta in Botswana. The Okavango Delta in Botswana, as seen from the space shuttle Discovery in 1985. NASA photo. Want to see sediment tumbling along in a runoff channel? Watch the grains of sand move from left to right in this video. Recognize that the water is moving a lot faster than the sand is. Since each grain of sand isn’t suspended in the water but is instead being rolled and bumped along the bottom, it has to contend with friction. When a bubble passes by, you’ll see how much faster the water is traveling. 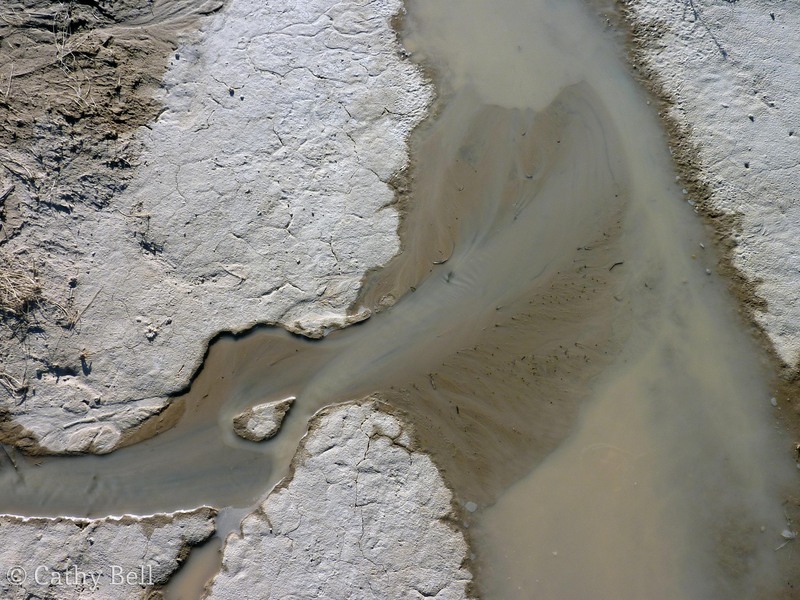 A braided river in southern Alaska. © Marli Miller, University of Oregon. What I love most about watching water on the landscape is that you can see it in action wherever you go. The patterns you observe in one place—even if it’s very small-scale, like the little badlands runoff channels—closely resemble those that occur elsewhere. Fascinating! I definitely learned much about the Badlands — a place I’ve ALWAYS wanted to visit. We’re so spoiled with the water issue today… I always think back to people traveling not that long ago, in the scope of time. It’s amazing. It is pretty incredible how much human life has changed in just the past century. But I think we can learn a lot from looking back to those times. With climate change shaping a drier West, we’re going to have to rethink our water use. Absolutely. More and more people are writing about it…. It’s just up to the common person to implement these little changes that will help so much. Which, of course, is the most difficult hurdle. Hey Cathy this is just so well done. Is it ok if I send this link on to some science teachers? Absolutely! In fact, they might be interested to know that one of my co-workers here developed a stream table program in which we have kids model erosion and deposition. We make a little erosion cake by baking a mix of sand, badlands clay, and epsom salts dissolved in water. Then students can drip water over it, watching as the sediment is carried away and then deposited in miniature (one inch) deltas at the bottom of the stream tray. Hi Cathy, i was just out backpacking in the badlands this past weekend and discovered an old well in the sage creek basin, full of water! do you think this would be filterable? it certainly did not look like the water left in the creek, thanks!